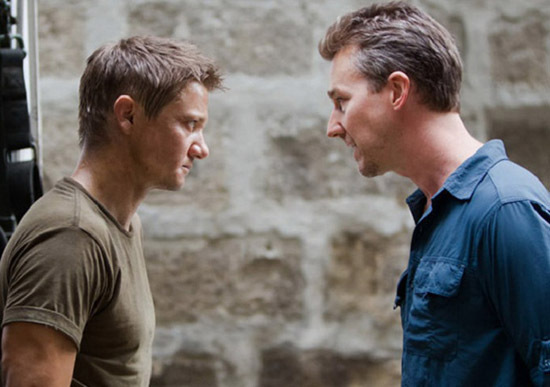 First Look at Edward Norton in Tony Gilroy's 'THE BOURNE LEGACY'! A new image has emerged online from Tony Gilroy's The Bourne Legacy. The movie features a whole new hero [Jeremy Renner] in the same universe as the first three Bourne films although the character of Jason Bourne [Matt Damon] will not feature. The Bourne Legacy hits theaters this August 3rd & also stars Oscar Isaac Joan Allen, Albert Finney, Stacy Keach, Rachel Weisz & Scott Glenn. Image via MTV. I'm reading: First Look at Edward Norton in Tony Gilroy's 'THE BOURNE LEGACY'!Tweet this!